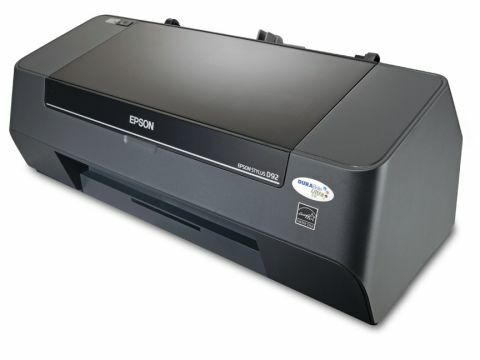 It's cheap as chips, but is this printer any good? We all like a bargain and on the surface this seems like a great one. But the cost of a printer needs to be weighed against its running costs. For this model, a new set of inks will set you back around £25. Effectively, then, the printer costs a fiver - the company is clearly relying on you to buy a lot of ink if it's going to turn a decent profit. The inks are Epson's DURABrite Ultra brand, and they do give good results when it comes to colour purity. Blacks in photographs lack depth, however, even on the expensive Ultra Glossy photo paper, although text feels black enough. There are, naturally, some compromises with such a cheap printer. The most obvious of these is speed. A 6x4-inch photograph at best quality took an astonishing five minutes 47 seconds to appear; dropping the quality more than halved the print time, but even then, two minutes 46 seconds is a long time to wait. Straight text printing wasn't much better, taking over eight minutes to print a standard 20-page document. Switching to fine printing (the middle setting between quick and photo) upped the print time to over half an hour with no discernible jump in quality. Overall, print quality is acceptable, but not stand-out. Text, when printed at anything less than photo quality, looks a bit rough, and photos too suffer from banding and spotty printing, unless the quality slider is right up to the top. The build quality feels predictably cheap, and the paper trays clip into place rather than folding neatly out of the way. Worse, it's a noisy beast, screeching like a banshee every time it pulls in new sheets of paper. Ultimately, though, this does the job if you're short of cash and don't anticipate printing high volumes. But we'd strongly recommend increasing your budget just a little, because at this very cheap end of the market, we think Canon still has the edge.